Question: What is the difference between using cast iron vs stainless steel vs nonstick cookware? Many folks just use whatever pan is in the cupboard or what was handed down to them. There’s nothing wrong with that. I did that in my early 20s when I was on a tight budget and learning to cook. This article provides a summary about the materials and their uses. You will get an informed choice between cast iron, nonstick, and stainless steel cookware. Let’s get to it. Cast iron cookware has seen a resurgence in popularity in recent years. With good reason: cast iron is durable, versatile, holds heat amazingly well, and can last a lifetime when properly cared for. As far as what to use cast iron for, it can cook anything well, but is fantastic for cooking stews, sauces, gravies, and pan-frying. It’s easily the best piece of cookware to reach for if you’re wanting to grill a steak up, but it’s too cold out to light the grill. It’s also a great baking dish — cornbread made in a cast iron oven proof skillet is simply delectable. For versatility, cast iron can be cooked on a stove, in the oven, or if you feel so inclined, even in a campfire. It also comes in many different shapes and varieties, such as having grill bars at the bottom for searing steaks. Many cookware manufacturers make Dutch ovens, too. Cast iron is truly a kitchen workhorse. There are a few caveats and downsides when using cast iron. As a general rule of thumb, you’ll want to avoid cooking acidic foods such as eggs, wine-based, and tomato-based sauces. The acidity can leech excess iron from the pan and get passed along to you in the food. Another downside with cast iron is maintenance, which can be quite involved. You can’t just throw your cookware in the dishwasher. They require careful hand washing. You’ll also need to regularly ‘season’ your pan. Seasoning is a process by which oil is baked into the pan. The oil bonds with the iron and forms a nonstick barrier, which can help with stickier foods. However, many manufacturers offer porcelain enameled cast iron cookware, which doesn’t require a seasoning procedure. When lining up cast iron cookware vs stainless steel cookware vs nonstick cookware, cast iron requires more care and cleaning and there are a few foods you want to avoid putting in if you can help it. With that said, most cast iron cookware brands make downright workhorses that are unequaled in frying and in-the-kitchen grilling. As such, no kitchen should be without at least one. The best stainless steel cookware can be a happy medium between nonstick Teflon and cast iron. The stainless steel is a mainstay of kitchen cookware. It can do just about any job well and comes in just about every form imaginable. It also happens to be the perfect tool for searing and caramelizing. Searing can bring out an enormous amount of flavor in meats and the best searing is undoubtedly done in a stainless steel pan. Stainless steel is also great for any other type of cooking you want to throw at it, whether it be stir-frys, soups, or just caramelizing onions. You can even toss a lid on your pan and finish cooking your meal in the oven. In fact, stainless doesn’t really perform poorly in any particular area of cooking, though you’ll find you’ll need more fat or oil for cooking lighter and sticker things. While stainless steel doesn’t hold heat as well as cast iron, you can get cookware that has copper sandwiched in between the steel, giving it immense heat conductivity. The copper helps keep things heated evenly, preventing hot and cool spots while cooking. Stainless steel cookware is generally easier to care for than cast iron; it’s dishwasher safe, though it can be a bit harder to scrub clean as opposed to nonstick cookware. When it comes to durability, stainless steel is right up there with cast iron. When properly cared for, it can last a lifetime. In comparison to cast iron and nonstick, stainless steel has more than it’s fair share of uses. From searing and caramelizing to baking pans and soup pans, it’s safe to say that most of your cookware should consist of stainless steel, with cast iron and nonstick holding the specialty spots. Nonstick cookware gets a bad rap. It’s been shown that the nonstick coating can deteriorate and decompose at higher temperatures. When the nonstick coating is heated to beyond 500° F, it begins to deteriorate and decompose, according to a Wikipeida article. While that certainly sounds scary, nonstick cookware has a place in the kitchen as long as it is used how it’s intended. Nonstick cookware is unbeatable when it comes to cooking light or sticky things. Eggs in any form, pancakes, crepes, and even softer cuts of fish are all perfect for this cookware. It’s also great to use if you’re whipping something up quick and simple and need fast cleanup. As for maintaining nonstick pans, it’s most definitely the easiest of them all: simply stick it in the dishwasher. The Teflon coating helps in removing stuck-on foodstuffs and makes cleaning a breeze. While maintenance is low, you’ll find that nonstick pans do not last nearly as long as stainless steel or cast iron. 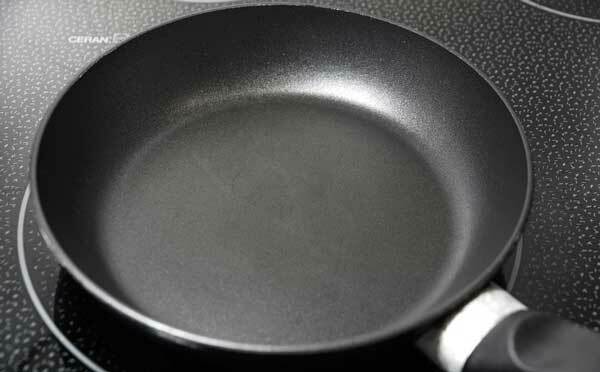 The Teflon coating can be easily scratched and eventually even flake off, leaving bits of the coating in your food. In putting cast iron vs stainless steel vs nonstick cookware, the nonstick variety should be considered a specialty piece and used where it excels — sticky foodstuff that requires low heat. When it comes to whipping up a batch of scrambled eggs, or sliding a crepe out of a skillet, nonstick pans have no equal. Every kitchen should have at least one for this purpose. Does this answer the question about the difference between using cast iron vs stainless steel vs nonstick cookware?